Contemporary sculpture of Lviv art school: experiment and self-identi cation. In recent years, there has been a special interest with the artists in the problems of contemporary art in its postmodern-contemporary manifestation. The article deals with some most expressive examples of experimental sculptures by the authors of Lviv art environment who lay the footing for development of contemporary art. The selected works were created after 2010. Relevant artists share a common experience of studying in different periods in Lviv National Academy of Arts. Despite the difference in creative specialties (monumental painting, monumental and decorative sculpture, art glass, etc.) all the artists whose works are suggested for analysis actively apply three-dimensional tools in their art that are referred to the sculpture and installation. We consider the works of Oleksa Furdiyak, Oleksiy Konoshenko, Nadiia Krivorotova, Vasyl Odrekhivskyy as well as art projects in the  elds of contemporary monumental sculpture and installations. The article con rms once again that a modern artist who feels no barriers and seeks innovation utilizes a wide set of creative tools to achieve the most complete transmission of ideas in space. The sculpture is increasingly synthesized with such art forms as performance, video art, assemblage, object (ready-made), sound installations etс. that exempt it from the  eld of static medium and such categories as time and place in new capacity represent for it the formative and descriptive catalysts. New system of relationships is also built in the line of “sculpture – viewer” when the usual, by now, contemplation is not enough: sculpture invites you to an interactive dialog and physical (tactile) interaction. 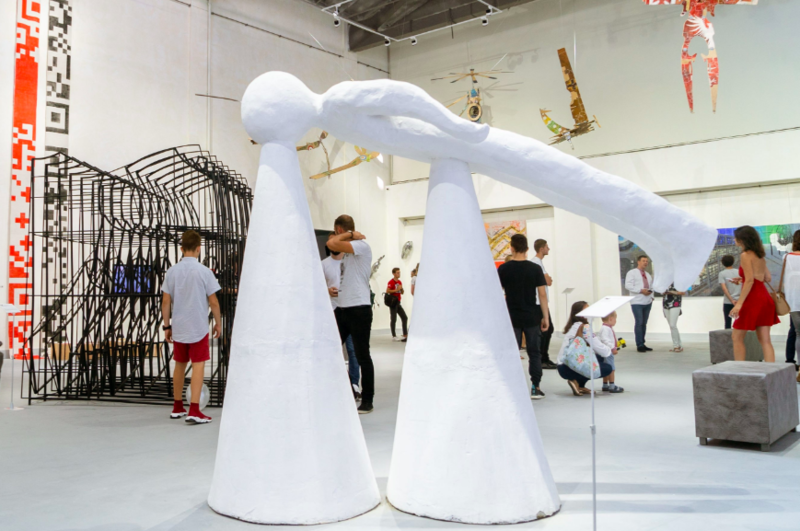 Analysis of the selected examples of Lviv experimental sculpture and installation will allow for an evaluation of  exible search for the young generation of artists as a layer vital for development of contemporary Ukrainian art. Lviv art space as a pulsating lively system of visual culture which has a considerable number of painters and artists of various areas, is able to produce colorful and diverse stream of creative experimentation. Despite the lack of a large contemporary art center in the city, which would be directly responsible for this area and popularize the latest  ndings of the artists, there is a number of curatorial, private, gallery initiatives that, taken together, become those very sites where contemporary art is created: “Week of Contemporary Art” Biennale under curation of Dziga Artistic Association, the project of “Integration” at B. H. Voznytskyi Lviv National Gallery of Arts, the project of “Camera” in the National Memorial Museum of Victims of Occupation Regimes, “Prison at Lontskoho Street”, exhibitions in Lviv Palace of Arts, and also, most recently, experimental educational and exhibition projects of contemporary art as arranged by Lviv National Academy of Arts. This is only a part of the initiatives that take place in Lviv and worth focusing in this article. There are also many other galleries and museums that increasingly attract media and installation projects along with their constant expositions. This shows the interest in new forms of Ukrainian art both of curators and spectators. Objectives. The purpose of the article is to demonstrate an extremely active movement and variety of creative searches in Lviv artistic environment in the last decade, discover new approaches to form creation, new tasks as being taken on by contemporary artists. Methods. The study uses the methods of description, comparison, artistic analysis and the inductive method that allow you to fully respond to the challenges set. Results. We state the integrated processes in threedimensional visual creation in Lviv, where clearly viewed boundaries are blurred, and the term of “sculpture” is applied to the most daring artistic experimentations, making it a versatile tool of the contemporary artist. Selected examples of works of Lviv artists demonstrate a wide range of artistic and aesthetic interests in the  eld of sculpture: from statics to kinetics, from metal to new materials, from  gurative to abstract and symbolic and metaphorical three-dimensional works. The atmosphere of the city with rich cultural heritage being combined with the traditions and experience of Lviv art school (namely, Lviv National Academy of Arts) creates the productive space where the motives for creative experimentation are originated. Conclusions. This study shows that the aim of contemporary artists of Lviv is not to praise, glorify or idealize human in its speci c personal or generalized dimension, however, search for a new attitude to human, its place in the modern world, its emotional condition and endurance in the entirety of existential belonging to the world. We can often state provocative solutions of the artists, at  rst glance, questionable in terms of aesthetics, durability and spiritual depth; however, they are an integral part of paradigm search for the identity of the modern Ukrainian artist. Sculptors are knowingly approaching the issues of scale, monumentality, contextual and spatial integration of works, which becomes the basis for rethinking the concept of the monument of our time, shows the prospects for effective development of sculpture in the whole. An important mission for young sculptors is to maintain and develop continuity of the traditions of Lviv art school which involves dozens of artists of the national and international signi cance. At the same time, the need to take responsibility for rethinking and development of the art of sculpture using professional base of skills for the sake of progress has become more relevant than ever before. 09.10.2018 | Filed under Excessus, Excessus 2018, Автори, Критика.